Italian studio Henry&Co has used a material created by binding hay and grass to form the seat of this untreated beech wood stool. Henry&Co designed the stool to fit a "circular economy" model, so chose sustainable and recyclable materials, which included both the beech wood and Ekolithos – a material made from hay and grass fibres. 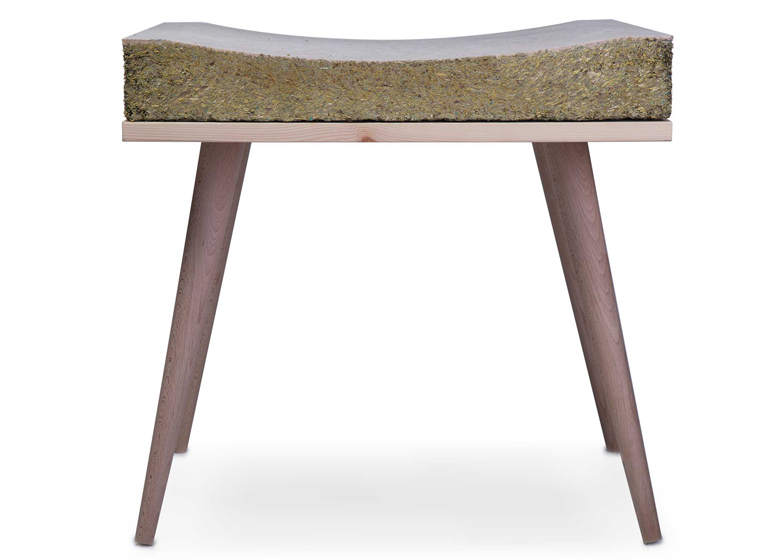 Named Chayr, the stool comprises four legs and a rectangular seat base – all made from beech – topped with the Ekolithos cushion. The design is inspired by the use of both hay bales and grassy spots used as seating places throughout the ages. "Hay bales are often used as resting places for farmers and grass offers a warm, soft spot to sit on a nice day," said Alex Crestan, who co-founded Henry&Co with Francesco Trubian. "This new use for those natural materials reminds the sitter of nature and natural wellbeing." Ekolithos is the name for a family of products made from waste materials using a natural binding agent made from honeybee secretion called royal jelly. The products are all free from oil and formaldehyde, are non-toxic and are produced from renewable resources. "The key point is the binding material used to merge the two natural elements," said Crestan. "In fact, it allows us to think about a new form of recycling and sets us apart from the oil production chain, giving a chance for local growth through our land resources." The designers have collaborated with sustainable production initiative CMF Greentech for several years and Chayr is the second project. The first was a rocking horse made from Canapalithos, another biomaterial and a precursor to Ekolithos. Henry&Co's ethos is based on rethinking existing products, rather than creating news ones. The aim is to improve not only their form and function, but also the environmental impact of their production and disposal. "We believe that the future is the sustainability of a product and that we must give greater accessibility in the marketplace, in contrast to the idea that ecological rhymes with elitist," said Crestan. "The world of sustainability, its market and its actors are now a layered and complex. It requires a strong and in-depth research and incisive ability to make innovations and products." Stools can evidently be made from all kinds of materials. Some of the most unusual include a design constructed from kitchen sponges drenched in vivid yellow PVC, a seat coated with black rubber cast from raw cauliflowers and a plastic pouf stuffed with recycled human hair.